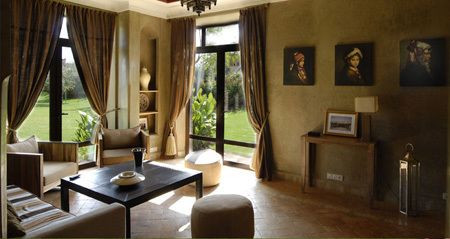 Outside the exotic Marakesh in Morocco we have found a new jewel with exquisite views towards the Atlas mountain range. Welcome to the Samanah resort. 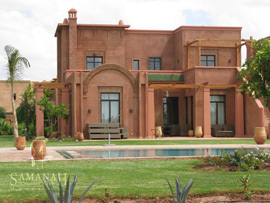 The exteriors and the plain, elegant, lines evoke those of the earthen architecture which is so typical of Morocco. The villas exterior architecture is enriched with details: contours of the windows and doors outlined with small bricks, wrought iron railings, wooden pergolas, subtly designed with the elegance you would expect from the top quality architect, Alain Lelieur. The façades come in various colours inclining towards earthy and ochre tones: beige earth, warm ochre, amber pink, pink earth, red earth. The whole composition along the streets is a rhythmic symphony of harmonious colours. Are you interested to invest in a golf property in the exotic Marrakech or want to request more information please call Golf investment (+34 629 705 335) or send us an e-mail. Knowing that the golf course is nearby and to walk to the spa or to the Square, there is an excellent compromise offered by the CHIPPING LAND houses called “Carissa”. Gathered round a golfing area, dedicated to the “pitch” and “putt” perfectionists, the CARISSA villas will allow you to fully enjoy the Samanah Country Club with all the investments nearby as well as the events that makes it so special and different. 108 villas with 3 bedrooms. Landscaped gardens designed by Pascal LOPEZ, Samanah’s landscape architect. Swimming-pools 15 m² or 18 m² in sizes and 1.40 m deep. Swimming-pools interior coated in cool blue diamond brite or grey to the investor’s choice. Automatic watering system for the gardens. Swimming-pool sun-deck and terrace: terracotta, decorated in zelliges. 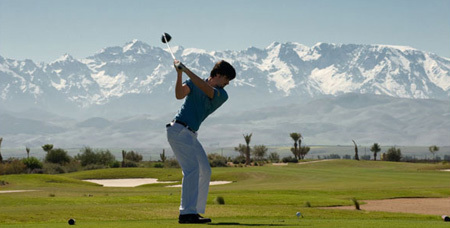 Golf areas covering 1,5 hectares devoted to perfecting approach moves. The view from each villa is one of the assets that the architect focused on in his design with an enticing choice of the golf course or the Atlas mountains. There is something for everyone, since most villas face the former or the latter, and some even face both. A core element of the resort, the golf course is located in the heart of Samanah and its different living spaces: the villa locations follow its contours. The work of both architects, Alain LELIEuR for the houses and Pascal LOPEZ for the gardens, have made it possible to harmonise these private spaces with the shape of the golf course. Living in Samanah and playing golf go hand in hand. Continuing the pleasure of the game by enjoying a relaxing view of the course from your own home is a privilege that most villa occupants will savour. Thus whether you are a passionate golfer or not, the golf course is your natural environment. 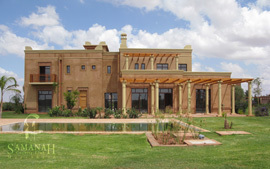 The exteriors and the plain, elegant, lines evoke those of the earthen architecture which is so typical of morocco. The façades come in various colours inclining towards earthy and ochre tones. The villas exterior architecture is enriched with details: coutours of the windows and doors outlined with small bricks, wrought iron railings, wooden pergolas, subtly designed with the elegance you would expect from the top quality of the architectes. The Amen Corner is an exclusive little island covering 3.5 hectares in the heart of the Samanah country Club private resort. 18 single-story villas surround a 1-hectare golfing area inspired by the arrival of hole No. 13 at the Augusta Golf course in the USA. Only the occupants of the 18 villas can access this exceptional playing area. The Amen Corner villas were designed with simplicity. Placed in the middle of a golfing garden and equipped with a swimming pool between their terrace and the golfing areas, these singlestory villas are discreetly elegant, thanks to their contemporary architecture and sleek lines. Amen corner was the name given by the journalist Herbert Warren Wind to holes No. 11, 12 and 13 on the Augusta golf course in Florida. On April 21, 1958 he wrote a column in the newspaper “Sports Illustrated” about Arnold Palmer’s first Masters title. Palmer had taken the lead after these three holes during the last round, notably thanks to an eagle on the par 5 (Hole No. 13). Searching for a name for this part of the course where such decisive events had occurred that year, Wind was inspired by an old jazz piece called “Shouting at Amen Corner”. Since then Amen corner has become world famous. Samanah is a place where everyone can make their own dreams come true, invent their own lifestyle, and experience their own moments of happiness. On a property that showcases the quality of life and the beauty of its natural surroundings, a multitude of atmospheres are available to residents and occasional visitors alike. Luxury at Samanah is accessible to everyone: children, parents, friends, families, sports enthusiasts‚ everyone can compose their own recipe for happiness, based on the many ingredients offered. 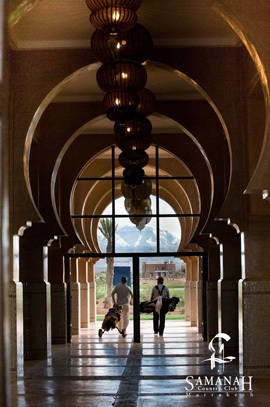 Located 8 km from Marrakesh'&s International Airport and 14 km from Jemaa El Fna Square , the Samanah Country Club covers an area of 285 hectares and has a greet view on the Atlas Mountains.